Online Registration Information - Just Cruises, Inc.
Due to increased security requirements most cruise lines now require all passengers to pre-register on-line for their cruise. For your convenience, registration can be completed ahead of time on the cruise line’s website. You'll need your reservation noted in the invoice, ship and sailing date, your personal information, as well as any contact information you wish to provide. Completing the Online Check-In process for all guests in your reservation will also save you from needing to fill out forms at the pier and will allow you to board quicker. Guests sailing on Azamara should complete their pre-cruise guest registration online prior to arriving at the pier if at all possible. Due to new government regulations, guests must check in on-line 3 days prior to their cruise or complete the process at the pier, using forms enclosed with your cruise documents, at least 2 hours prior to the published sailing time. If you are unable to pre-register online, call Just Cruises, Inc. for assistance. Guests sailing on Carnival should complete their pre-cruise guest registration ("Fun Pass") online prior to arriving at the pier. Carnival no longer provides paper documents. You will need to print out your documents and luggage tags. If you are unable to pre-register online, call Just Cruises, Inc. for assistance. Guests sailing on Celebrity should complete their pre-cruise guest registration online prior to arriving at the pier. Due to new government regulations, guests must check in on-line 3 days prior to their cruise. You will need to print out your "Xpress Pass" and order your luggage tags while online. If you are unable to pre-register online, call Just Cruises, Inc. for assistance. Guests sailing on Costa should complete their pre-cruise guest registration online prior to arriving at the pier. If you are unable to pre-register online, call Just Cruises Inc. for assistance. Guests sailing on Crystal Cruises should complete their Online pre-cruise information prior to arriving at the pier. If you are unable to pre-register online, you may either print the available PDF file or complete the registration forms which will arrive with your cruise documents. If you are unable to pre-register online, call Just Cruises, Inc. for assistance. Guests sailing on Cunard Line should complete their pre-cruise information prior to arriving at the pier. You need to complete online using the Cunard "Voyage Personaliser" up to 6 days prior to sailing. Guests who fail to provide complete and accurate information prior to embarkation must complete check-in at least 90 minutes prior to the vessel’s scheduled departure time or they will be denied boarding. If you are unable to pre-register online, call Just Cruises, Inc. for assistance. Guests sailing on Disney Cruise Line should complete their Online pre-cruise information prior to arriving at the pier. If you are unable to pre-register online, you should complete the immigration forms enclosed with your cruise documents promptly upon receipt and follow the directions provided for mailing or faxing back to Disney Cruise Line. If you are unable to pre-register online, call Just Cruises, Inc. for assistance. Guests sailing on Holland America should complete their pre-cruise guest registration online prior to arriving at the pier. Holland America no longer provides paper documents. Click on "Online Check-in" and print out documents and luggage tags. 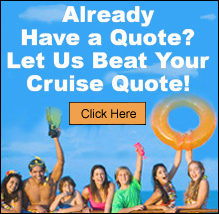 Call Just Cruises, Inc. if you need assistance. Guests sailing on NCL should complete their pre-cruise guest registration online with "Advanced Guest Check-in" prior to arriving at the pier. If you are unable to pre-register online, call Just Cruises, Inc. for assistance. Guests sailing on Oceania Cruises should complete their pre-cruise guest registration online prior to arriving at the pier. If you are unable to pre-register online, you will receive pre-cruise forms with their documents which should be completed and either mailed or faxed to Oceania Cruises. If you are unable to pre-register online, call Just Cruises, Inc. for assistance. Guests sailing on Princess should complete their pre-cruise guest registration online. Princess Cruises no longer provides paper documents. To register online complete the "Personalizer" then print a boarding pass and luggage tags for each guest sailing. If you are unable to pre-register online, call Just Cruises, Inc. for assistance. Guests sailing on Regent Seven Seas Cruises must complete their pre-cruise registration forms prior to cruise documents being issued. Guests will receive pre-cruise registration forms from your booking agent. Please complete promptly and follow the directions provided for mailing or faxing back to Regent Seven Seas. If you are unable to pre-register online, call Just Cruises, Inc. for assistance. Guests sailing on Royal Caribbean should complete their pre-cruise guest registration online prior to arrival at the pier. Once this is completed print out "Set & Sail" pass and order luggage tags prior to embarkation. Check in on-line at least 3 days prior to the cruise or you will have to complete the process at the pier. Arrive at least 2 hours prior to the published sailing time due to Government Regulations. If you are unable to pre-register online, call Just Cruises, Inc. for assistance. Guests sailing on Seabourn Cruise Line should complete their pre-cruise information prior to arriving at the pier. You may either register online or complete the registration forms which will arrive with your cruise documents and mail or fax to Seabourn. If you are unable to pre-register online, call Just Cruises, Inc. for assistance. Guests sailing on Silversea Cruises are now required to complete the online Guest Information Form. For security purposes, Final Cruise Documents cannot be mailed and Silver Sky Air Program tickets cannot be issued until Silversea receives this completed form. When completing the Guest Information Form, the Guest's Name must appear exactly as it is shown on the guest's passport. If you are unable to pre-register online, call Just Cruises, Inc. for assistance. Guests sailing on Star Clippers Cruises should complete their pre-cruise information prior to arriving at the pier. Enter your Last Name and Booking Id to login online. Guests will receive pre-cruise forms with their documents which should be completed and either mailed or faxed to Star Clippers. If you are unable to pre-register online, call Just Cruises, Inc. for assistance. Guests sailing on Windstar Cruises should complete their pre-cruise information online prior to arriving at the pier. If you are unable to pre-register online, call Just Cruises, Inc. for assistance. The U.S. Government will requires all travelers flying to or from Canada, Mexico, Central and South America, the Caribbean, and Bermuda, including U.S. citizens, be in possession of a valid passport. Click here find out how to get a passport. Passengers who are departing from and returning to a US port will need both a birth certificate with a raised seal and a government issued photo ID. All passengers must present the required documentation at embarkation. Guests without the required documentation will be denied boarding and no refund will be issued. Please understand that cruise lines will strictly enforce this requirement to be in compliance with this important U.S. Government mandate. Non U.S. nationals should contact their respective governments for further details.